"With Alpha Anywhere, coding is optional. We were able to quickly transform a complex web application to a responsive mobile app without worrying about coding. We could focus on designing the mobile experience, updating the forms and database, and publish it for our iPad, iPhone, and Android users." 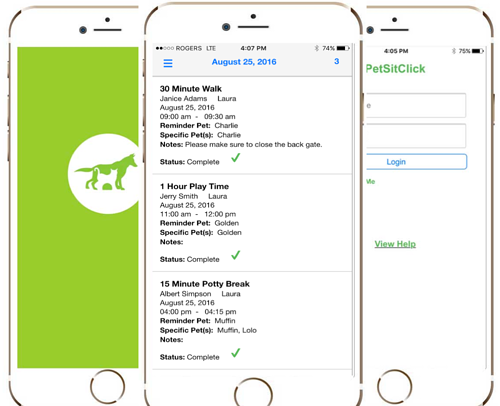 PetSitClick is a world-class SaaS ERP mobile and web platform for dog walking and pet sitting companies across North America. The system manages all aspects of a animal care-givers business, from tracking pets to invoicing customers. PetSitClick's founders wanted to build a scalable SaaS ERP platform for small to mid-sized businesses. After considering tools such as Ruby, PHP, Java, Visual Studio, and others, they realized programming would require substantial time and staff. They wanted an alternative that minimized coding and maximized productivity, but could still deliver a robust SaaS experience. They also wanted a platform where updates and improvements could be handled by a small on-site team. Dog walking, pet sitting, and pet services might sound like a mom and pop industry, but these are surprisingly complex businesses in a $4.54 billion industry. For example, each PetSitClick subscriber might have dozens of workers managing hundreds of dogs per day. The software had to make it easy to manage schedules, logistics, medications, health monitoring, feeding, grooming, special diets, off-hours and holiday visits, hygiene, and more—not to mention receivables, payables, and other requirements essential to any business. Stability is also crucial to PetSitClick’s customers. Slow performance or server downtime can mean life or death for a beloved pet if it has special needs, such as diabetes, where medical visits are required. This gives new meaning to the words, “mission critical.” There are also pets that need medications for non-life-threatening conditions, such as ear infections. A pet service could lose a customer if they miss a treatment due to downtime. The software had to make it easy to manage schedules, logistics, medications, health monitoring, feeding, grooming, special diets, off-hours and holiday visits, hygiene, and more—not to mention receivables, payables, and other requirements essential to any business. After researching and testing various tools, they were impressed by the maturity, scalability, and "coding optional" web and mobile capabilities of Alpha Anywhere. They went to work developing their SaaS ERP product. It was ready to go in just seven months. Moreover, customers kept suggesting new features and enhancements. Thanks to Alpha Anywhere’s coding-optional development technology, it was easy to quickly make changes. PetSitClick’s small team simply updated the required forms and database, and published a new version without any coding. "We were able to quickly transform a complex web application to a responsive mobile app without worrying about coding. We could focus on designing the mobile experience, updating the forms and database, and publish it for our iPad, iPhone, and Android users." Soon after, PetSitClick decided to deliver a mobile version that would give their customers a world-class experience on the iPad iPhone, Android, and Windows smartphones. Using Alpha Anywhere's coding-optional mobile technology, they were able to deliver a soup-to-nuts mobile experience in just four weeks. The new mobile experience can be used with just one hand, a crucial feature for people who are using their other hand to hold a leash. It’s also a true mobile app that uses the same database backend and business logic as the desktop and laptop web version. Users can view their schedule in the morning and head directly to their first or next appointment. They can also use GPS-powered check-in and checkout that logs their locations on a Google Maps map. And there’s also a portal that lets pet owners request services, view invoices, and conduct other activities. Using Alpha Anywhere's coding-optional mobile technology, they were able to deliver a soup-to-nuts mobile experience in just four weeks.